What can Hamilton do next to fight climate change? What can be done about climate change in the Hamilton area where we have suffered from 20 extreme rainstorms that have flooded homes in the last decade, and extensive damage and costs from high winds and ice storms in the last year? Join Hamilton 350 and other co-hosts on Monday May 12 to become part of the solution. We’ll hear from top climate scientist Dr. Gordon McBean, Durham Region sustainability manager Brian Kelly, and aboriginal voices. The climate change forum is on Monday May 12 in the Hamilton Central Library (55 York Boulevard, Hamilton) starting at 7 pm. 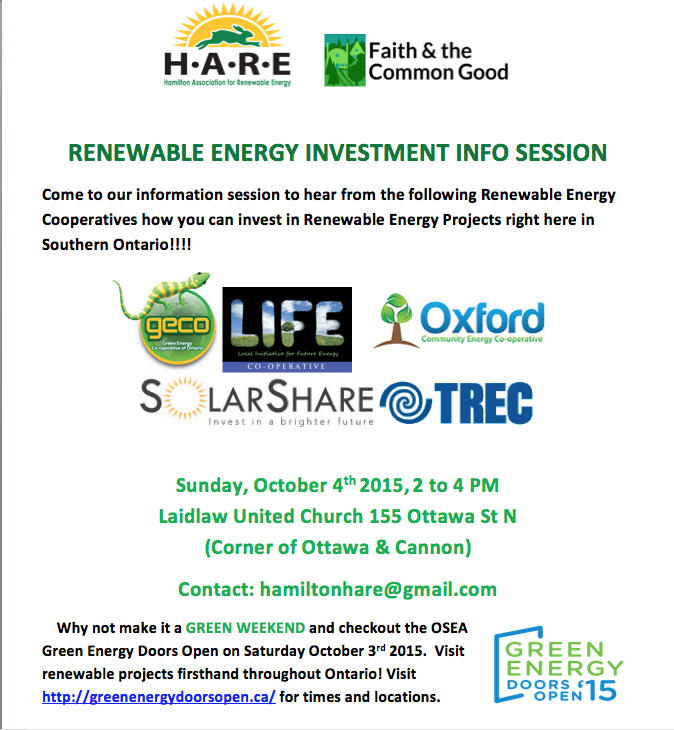 It is hosted by the Hamilton 350 Committee, the Council of Canadians Hamilton Chapter, Environment Hamilton, Green Venture, and Idle No More. It is co-sponsored by ten community organizations. April 5th was a fantastic day for touring the beautiful Meadowlands Fellowship Christian Reformed Church, located in Ancaster, Ontario. This house of worship is the only exclusively geothermally heated and cooled church in North America. For this facility, “exclusively” means that there are no secondary sources of heating or cooling. Even through this past cold winter, the geothermal system kept the congregation warm. Denise Neutel provided our tour. She is a member of the church’s building committee. 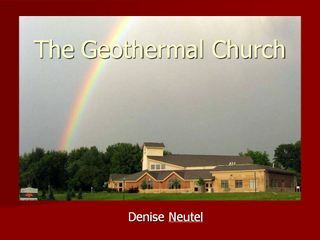 To bring us up to speed, Denise provided an overview of various geothermal techniques. These include Open Loop, Lake Loop, Horizontal Loop and Vertical Loop. All of these use the temperature of the ground (or water) as an energy source for heating or cooling, combined with a heat pump to transfer that energy into the home or facility. Her presentation is included here for your reference. 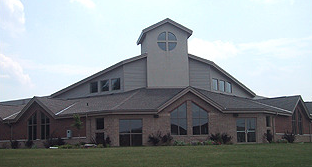 Meadowlands Fellowship Christian Reformed Church used a Horizontal Loop system. These require a shallow excavation of 1-2 metres (3-6 feet) over a fairly large area of land. The church took advantage of their planned parking area, and buried their loops two metres down before construction of the parking lot. 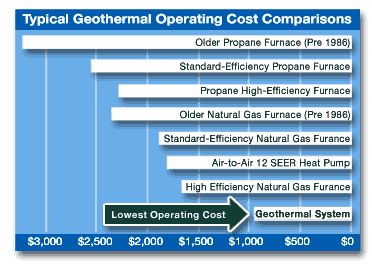 The bottom line is geothermal has the lowest operating cost of any currently available system. In selecting geothermal, the building committee examined case studies, including one from Oklahoma City comparing two buildings. One building used geothermal and the other used an efficient commercial Variable Air Volume system. By comparing energy use and greenhouse gas emissions, it was clear that geothermal was the superior option. The building committee then partnered with an architect, an engineer and Next Energy. The congregation was impressed and building commenced. The congregation moved into their new building in late 2005, where an array of environmentally sound practices were working together to keep operating costs low. Beyond the geothermal system, construction included Insulated Concrete Forms for specific exterior walls, additional insulation, compact fluorescent bulbs to replace standard incandescent, occupancy sensors to switch off lights in several areas, waterless urinals and LED lamps for all outdoor lighting. With all these factors, their savings on energy are very impressive. Using their highest quarter energy cost, they calculate an average of $0.96 per square foot per year (for electricity and water combined). The average cost for similar sized buildings falls between $2.00-3.00. Improvements were made to the geothermal system in 2012 to increase the efficiency.